“Fullerene single wall carbon nanotube complex for polymer bulk heterojunction photovoltaic cells,” featured as the June 21, 2007 cover story of the Journal of Materials Chemistry published by the Royal Society of Chemistry, details the process. 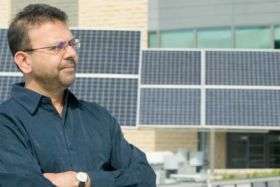 Harvesting energy directly from abundant solar radiation using solar cells is increasingly emerging as a major component of future global energy strategy, said Mitra. Yet, when it comes to harnessing renewable energy, challenges remain. Expensive, large-scale infrastructures such as wind mills or dams are necessary to drive renewable energy sources, such as wind or hydroelectric power plants. Purified silicon, also used for making computer chips, is a core material for fabricating conventional solar cells. However, the processing of a material such as purified silicon is beyond the reach of most consumers. The solar cell developed at NJIT uses a carbon nanotubes complex, which by the way, is a molecular configuration of carbon in a cylindrical shape. The name is derived from the tube’s miniscule size. Scientists estimate nanotubes to be 50,000 times smaller than a human hair. Nevertheless, just one nanotube can conduct current better than any conventional electrical wire. “Actually, nanotubes are significantly better conductors than copper,” Mitra added. Mitra and his research team took the carbon nanotubes and combined them with tiny carbon Buckyballs (known as fullerenes) to form snake-like structures. Buckyballs trap electrons, although they can’t make electrons flow. Add sunlight to excite the polymers, and the buckyballs will grab the electrons. Nanotubes, behaving like copper wires, will then be able to make the electrons or current flow. How would the energy be used? I see how the energy would be created, but I don't see how the energy could possibly be transfered from the film or paint to an applience, heating unit, or car engine. Also, couldn't the large amount of carbon used to harness the suns energy be dangerous? If there is a way to contain the carbon and transport the energy, is this on the market yet and how much would it cost?